Pastor Maas met with Anna several times over the following months. One thing Anna shared was her sadness that so many children in her village were orphans due to Aids. Even before she traveled to the U.S., she envisioned how different the future of her village could be if these children were to be raised in the Christian faith– specifically the confessional Lutheran faith. In addition to having a Christian school, Anna also expressed the hope of having a Lutheran Church faithful to the Word of God in her village. The brethren of Holy Cross agreed to join hands with the Sagala family in the endeavor of establishing a church and school at Emmaus Milimani. It started with Holy Cross sending school supplies for the children. Anna received CD’s of Holy Cross worship services which were used for worship in Kenya. Other religious material were also sent to provide spiritual nourishment. A tent was used to begin with for those gathered around the Word of God. Later on, the Sagala family donated land and lumber from their farm to construct a church building. This structure with mudded walls not only served as a place of worship, but also as a school for the children. Emmaus Hill School, which is now in its third year, has four grade levels (preschool, kindergarten, first and second grade). There are 3 full time teachers whose salaries (about $40 a month per teacher) are being covered by Holy Cross of Phoenix. For the 2010 school there were 107 students in three grade levels. 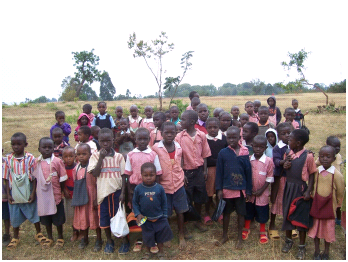 Approximately 30 of the children are orphans. For the opening of the 2011 school year a two room school of wood and mud construction was erected with donated land and wood from the Sagalas. 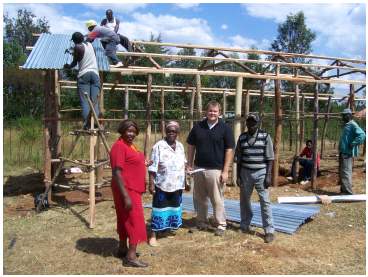 The roof of metal sheets were given by CLC Project Kinship, and members of the congregation supplied the labor to build it. In the latter part of 2010, Holy Cross called Pastor Michael Gurath to serve as missionary to Holy Cross Lutheran Church and School in Emmaus Milimani. For close to six months Missionary Gurath led the worship services, conducted catechism classes (1 to 2 hours) after Sunday services, as well as adult instruction classes on Fridays, and also weekly Bible study. Missionary Gurath also served as instructor for one week a month at the Kenyan CLC Seminary in Chotororo near Kisii. Missionary Gurath, who has been on a brief furlough in the United States, will be returning to Kenya this summer. Besides serving those in Emmaus Milimani, he will again be teaching at the seminary in Chotororo. There are two men from the Emmaus congregation who will be attending this seminary. Jasper Juma Musakali will take a 2 year evangelist training course and Amos Otieno will attend the four year course in the hopes of serving as the future fulltime pastor at Holy Cross in Emmaus Milimani.